Or straggly. 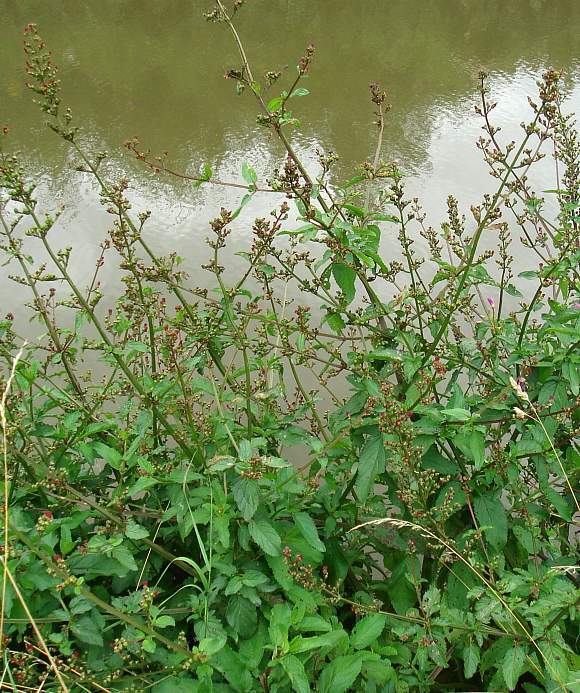 Most often found on the edge of freshwater; lakes, canals, reservoirs, rivers, streams. The tallest one I ever did see. 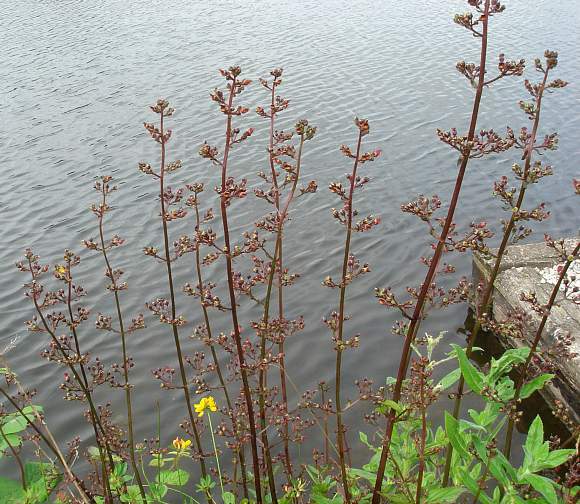 According to the books, Water Figwort grows to 1.5m high, but this one was about 2m or even more high! The leaves are opposite (check the shadows). A well-branched specimen. Leaves opposite. 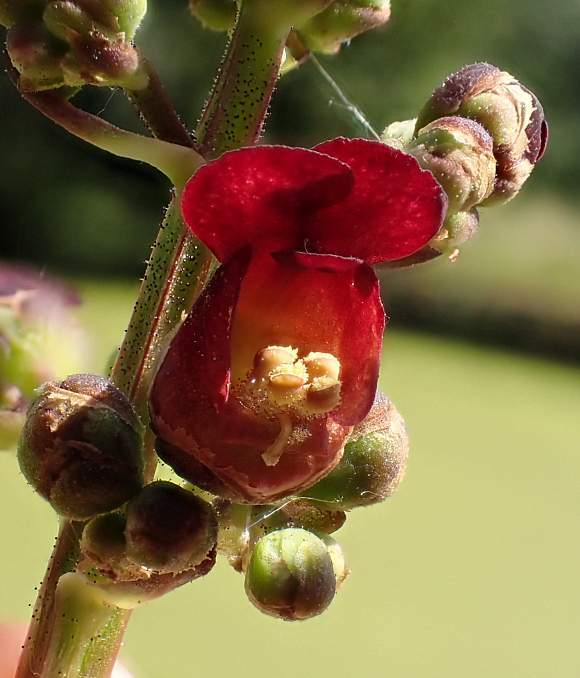 Most of the flowers here are changing to fruit, which has a long single style still attached at the slightly pointed tip. Flowers at the top changing to fruit. Two lower flowers still flowering. Flowers from the rear. 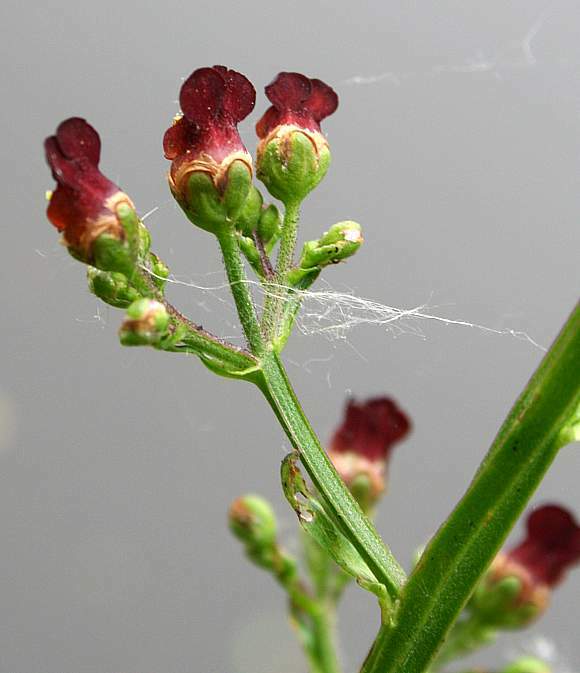 Sepals are rounded and with a 0.5mm - 1mm wide pale border. Full frontal. 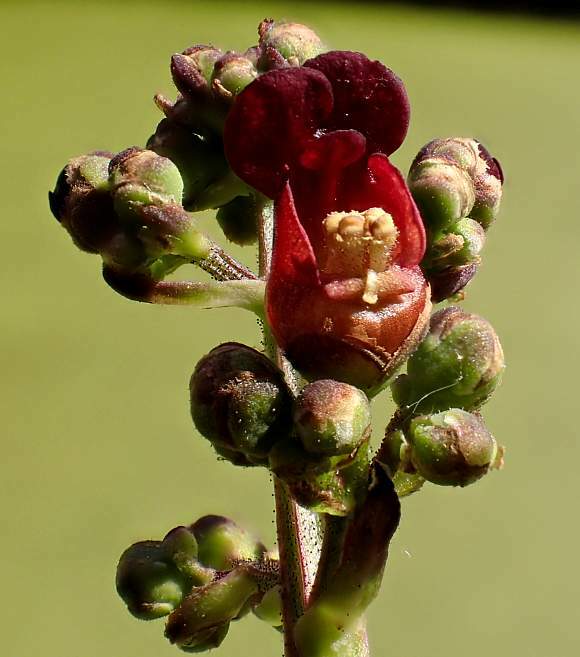 The flower has 5 petals: two largest at the top like a baseball cap hood, two shorter side shields and the bottom one shorter still. The 'paddle' shaped thing just below the two top petals is a fifth and sterile stamen called a staminode. There are 4 fertile stamens below them nearest the lower lip. 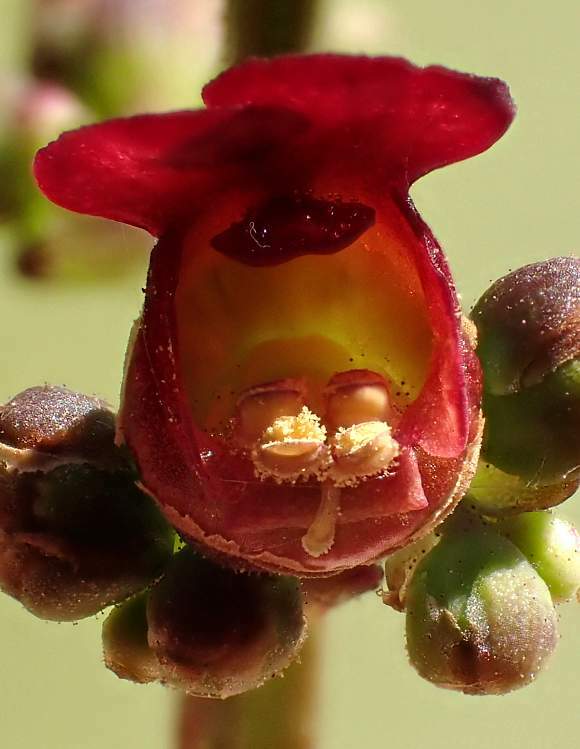 Four fertile stamens huddled in a rectange in the lower half of the flower. A single style with discoidal stigma drapes over the lower lip. 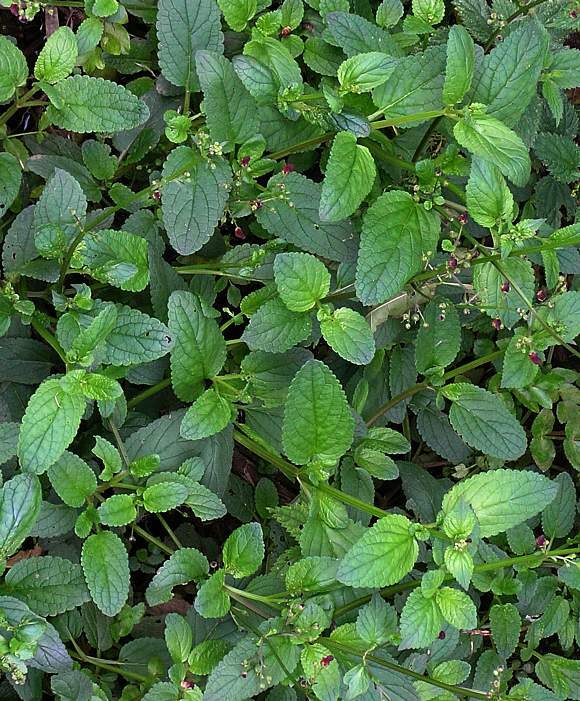 The plant has a medium-density of very short hairs with black glands at the tip. 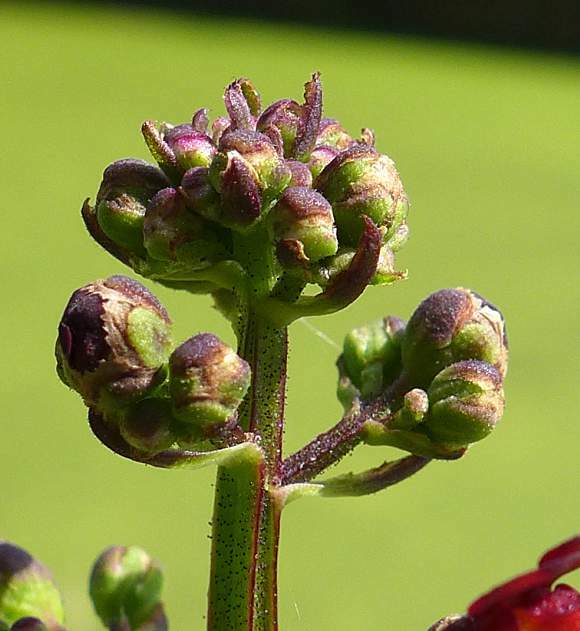 As-yet unopened flower buds surround the open flower. 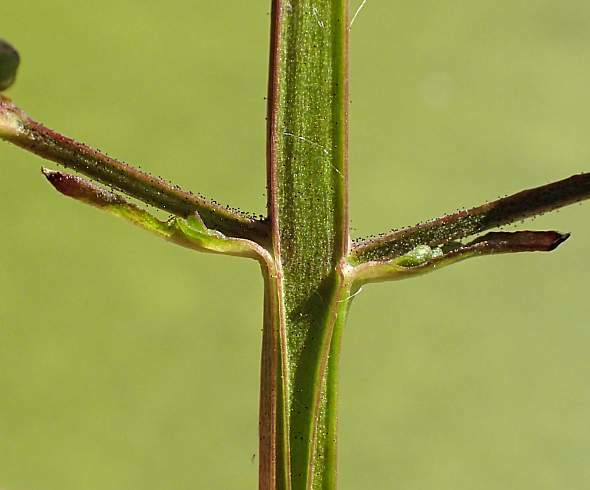 The square stems have wings at the corners. The 4 fertile stamens have cream-coloured pollen. Turning to fruit. 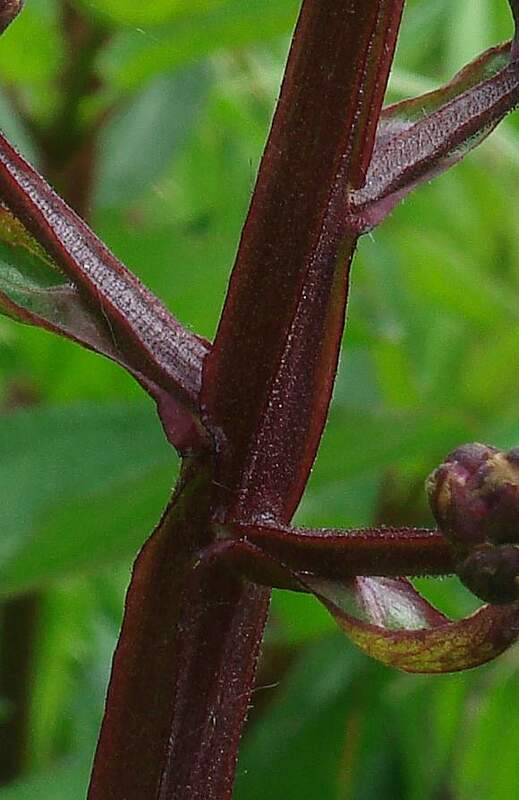 The sepals still have 0.5mm - 1mm wide paler margins. Doing the twist like it did last Summer. Not all are twisted like this, this is the first one your Author has seen, but it allows to see a few of the square edges with their wings at once . Beneath each flower branch is a linear bract. This shows the flanges or ribs on each corner. An untwisted stem. They are square with ribs on each corner. Not all have furrows / flutes like does this specimen. Glandular hairs like tiny black-headed pins. 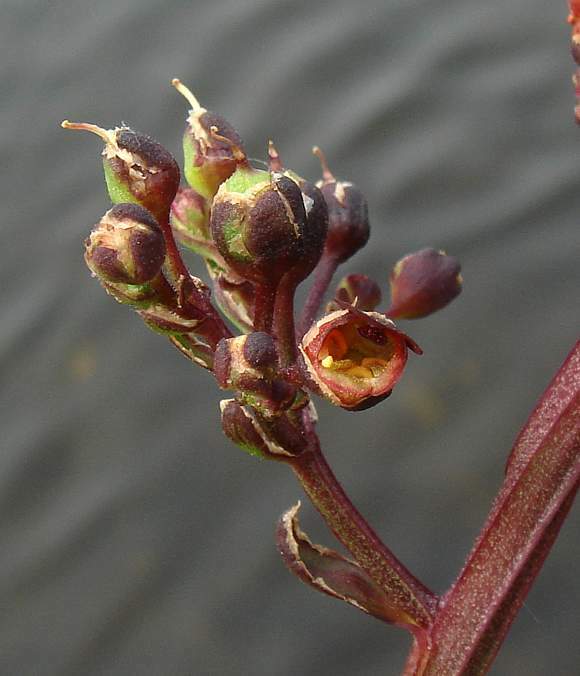 Water Figwort is usually hairless. It Feels Groovie. This specimen strongly winged on the corners. 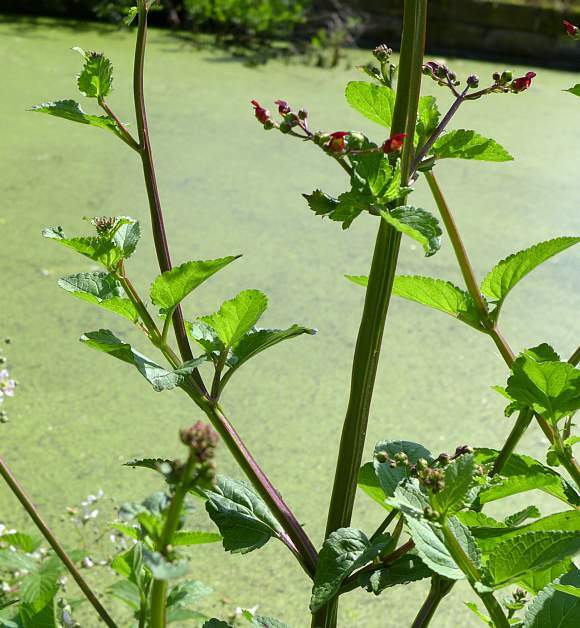 All the hairs on Water Figwort are short and glandular, with a black bobbly gland on the ends. But the plants are usually hairless. 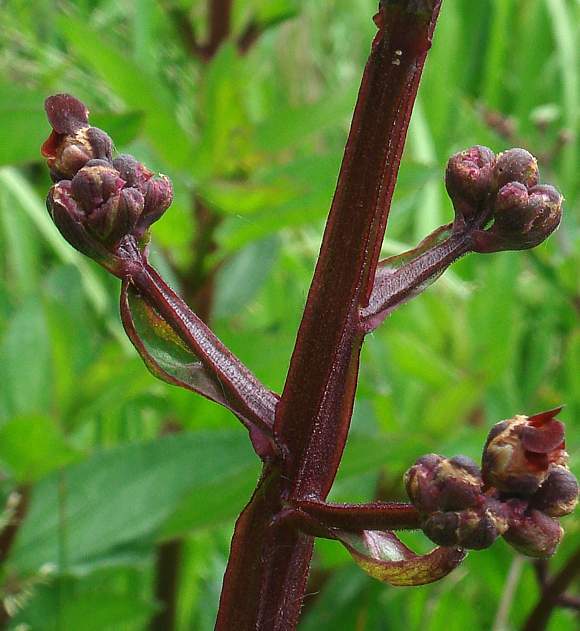 The stems are shaped in cross-section more like steel girders - i.e. the wings are parallel to each other (and not at right-angles in a '×' as might at first be assumed on a square stem). 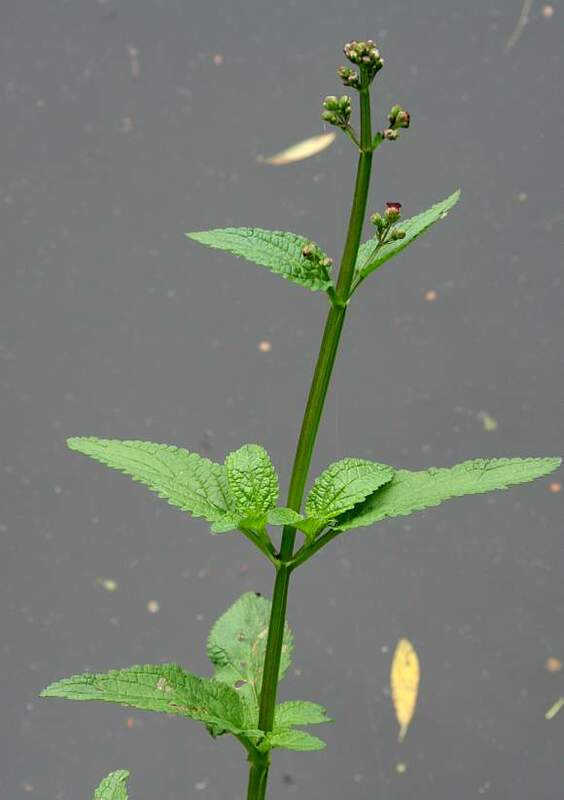 The leaves vary in shape, either oval, elongated cardioid, all with either a rounded or an acute tip and with or without an extra opposite pair of smaller leaflets on the stalk. 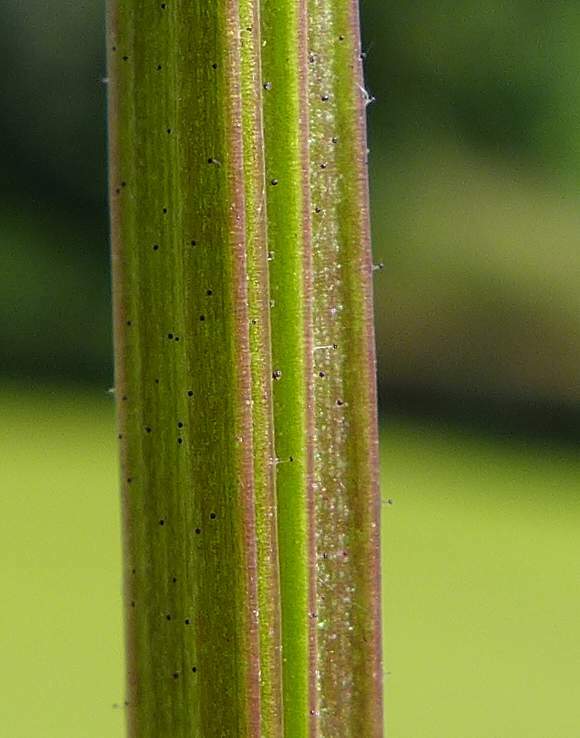 Not all leaves have a pair of opposite leaflets near the base of the larger leaf. 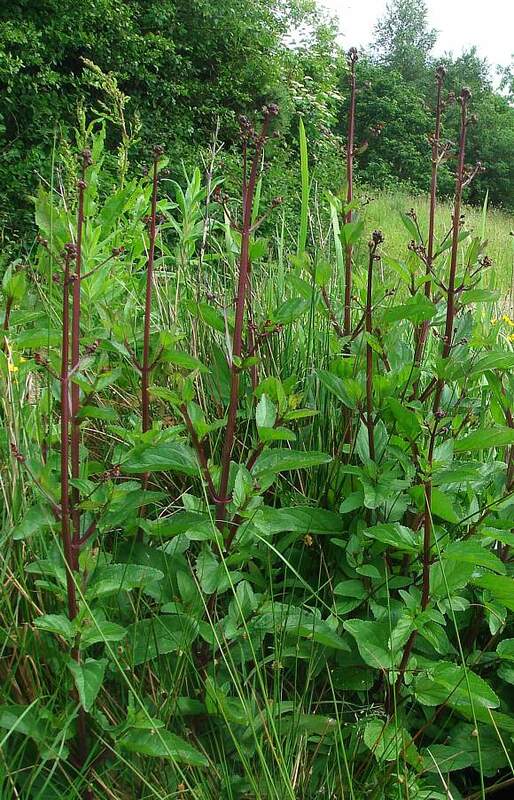 This specimen has at least some leaves with opposite pairs of smaller leaflets on the stalk. 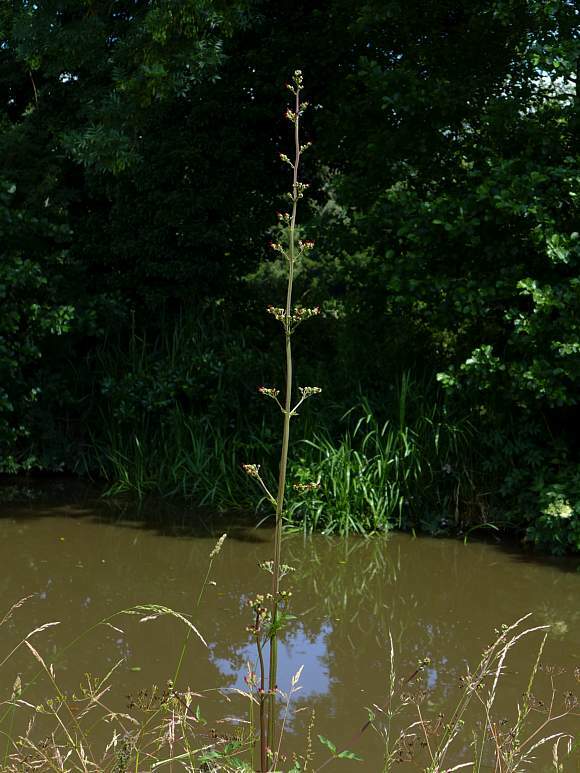 This specimen is suffering because it chose not to grow beside water, but in a place which can be rather dry in summer. The leaves have winged stalks. 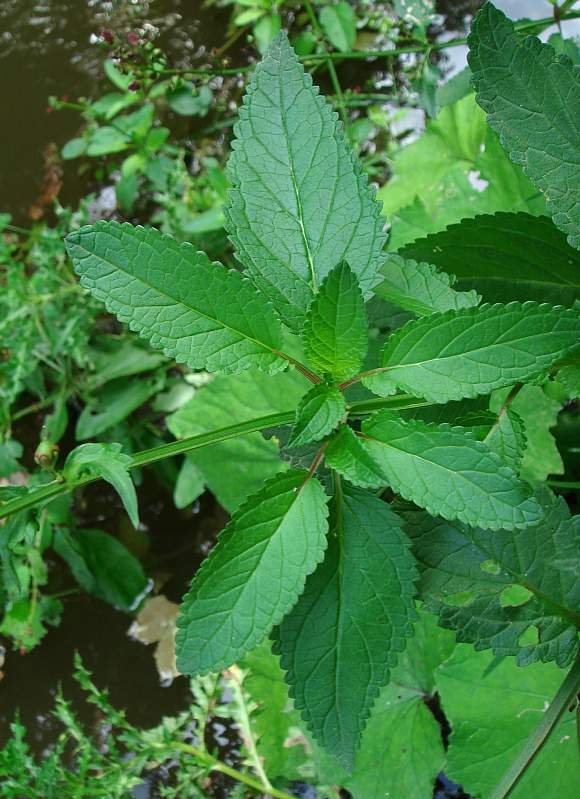 Leaves with (crenate) rounded teeth, but they can also be bluntly toothed. 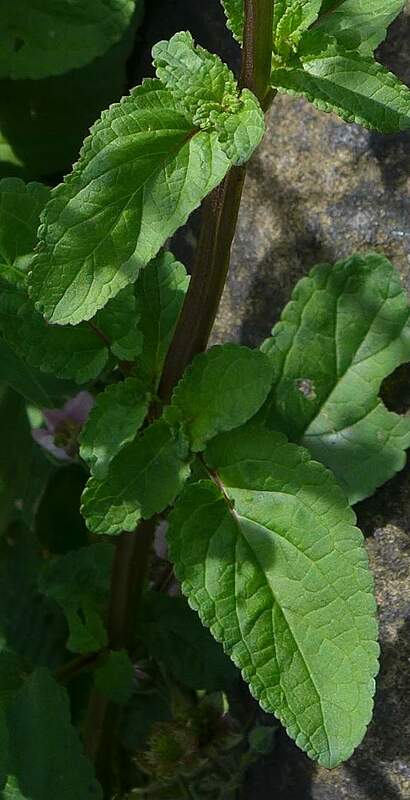 This specimen is recursive; it has leaves which have a smaller pair of leaflets, which have a smaller pair of leaflets, which have a smaller pair of leaflets... (possibly iterating beyond the resolution of the photogragraph). 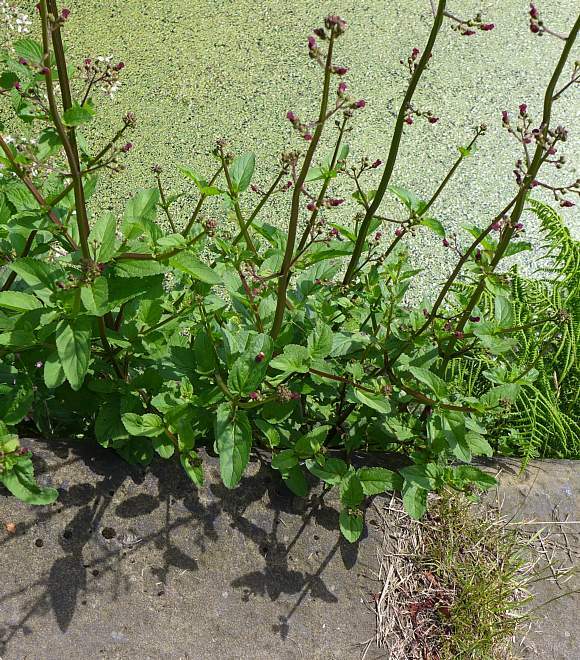 Not to be semantically confused with : Fig (Ficus carica), Hottentot-Fig (Carpobrotus edulis), Angular Sea-Fig (Carpobrotus glaucescens) or Fig-leaved Goosefoot (Chenopodium ficifolium [plants with similar names belonging to differing families]. 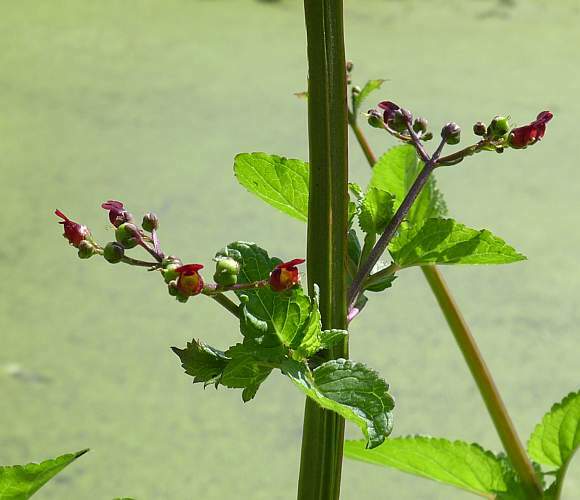 Water Figwort grows mainly in the UK south of the border with Scotland, but also avoiding much of Wales apart from South Wales, and less common in Lancashire and seemingly avoiding much of Cumbria. Present also In Ireland but mostly in the west and south. 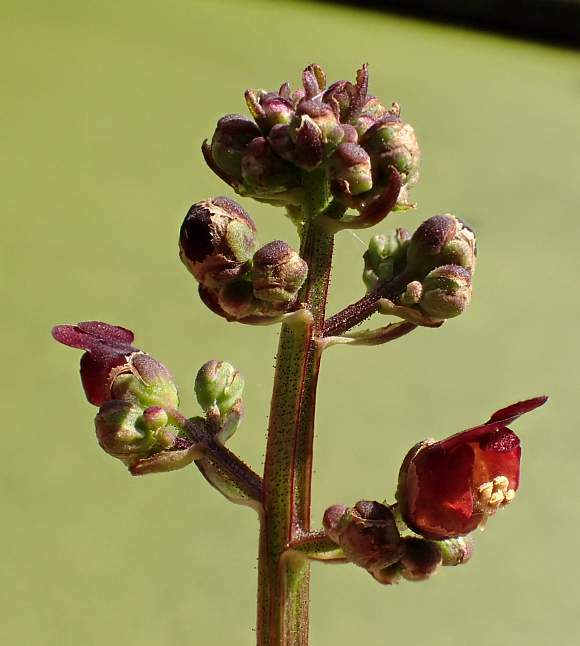 It is about half as common as Common Figwort (Scrophularia nodosa) (which grows over almost all of the UK apart from the North and North-East of Scotland). 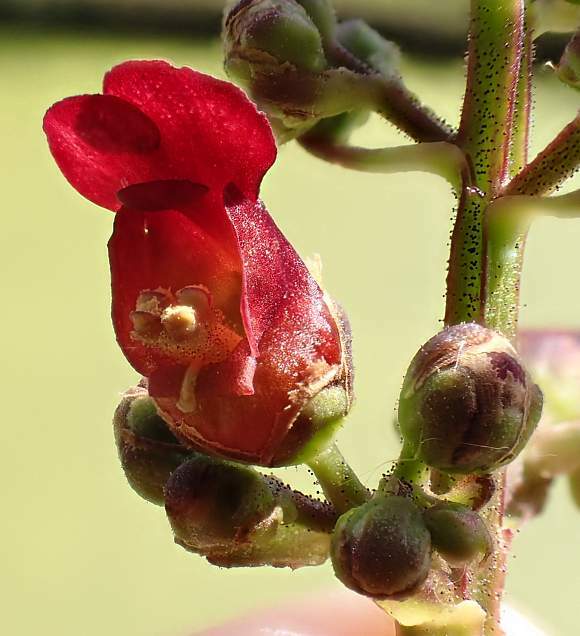 Not related to: Cape Figwort (Phygelius capensis). 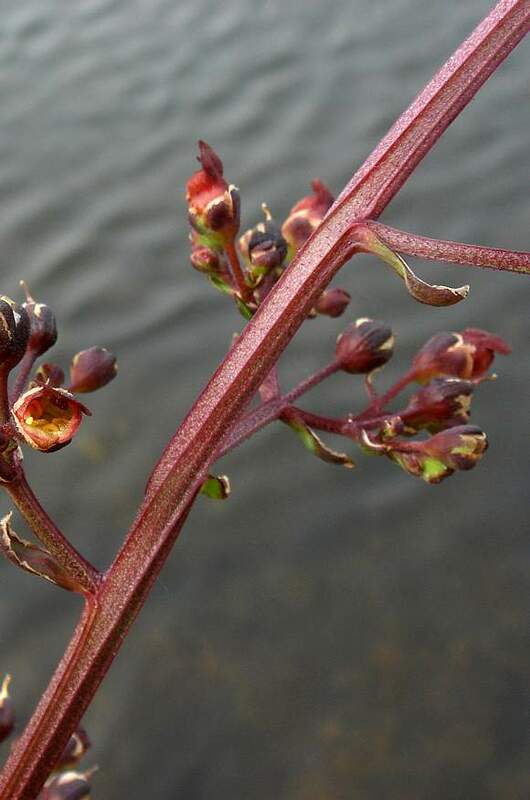 The flower spike possesses numerous small leafy bracts beneath the branches. 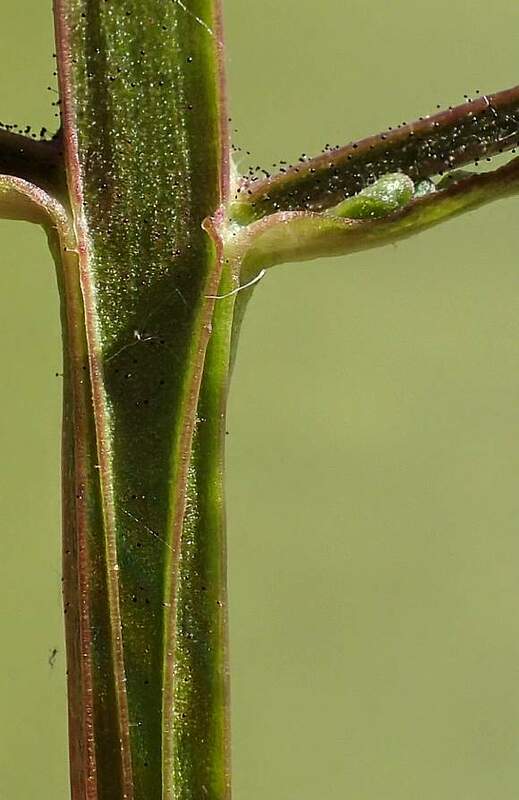 The stems have broader wings, especially nearer the bottom. The leaves have more teeth and the teeth are smaller. 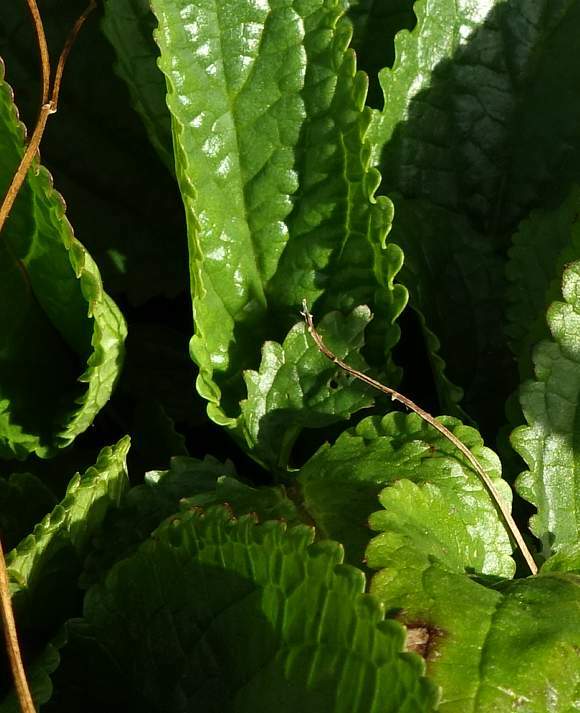 The leaf teeth are slightly pointed, never crenate. The staminode (the sterile 'anther' nestling just beneath the top petals) is wider than it is long with two lobes. It varies in shape, some being obovate, others truncate ('snipped' short at the front) or emarginate (with a notch in the centre at the front). 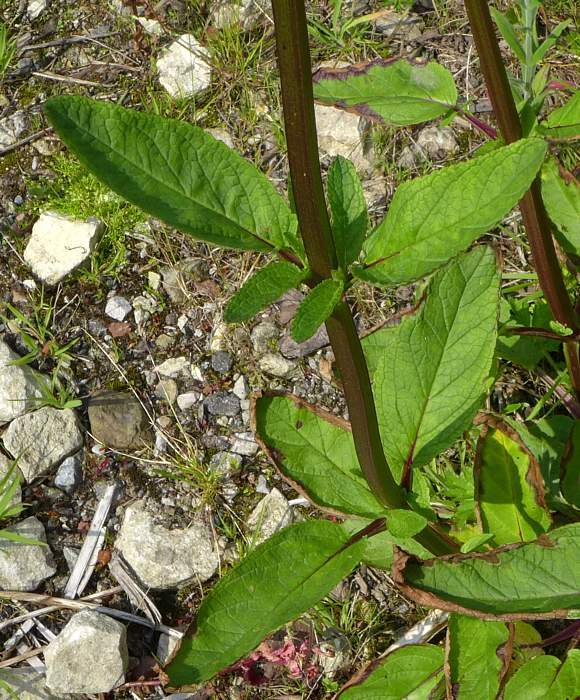 Although the petioles (stalks) of the leaves are all winged (just as those of Water Figwort are) they do not possess a smaller and opposite pair of leaflets. Purple for the Saponin moiety. 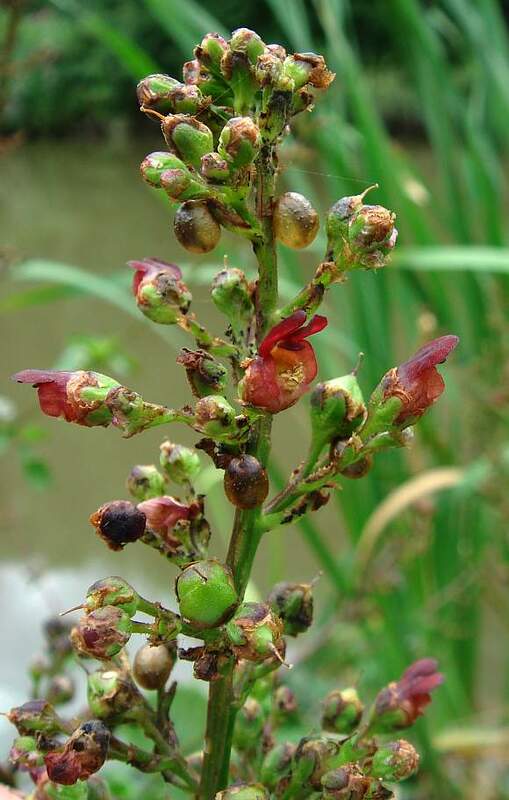 All these compounds contribute to the toxicity of Water Figwort, and uses may be found for some of them in medicine. 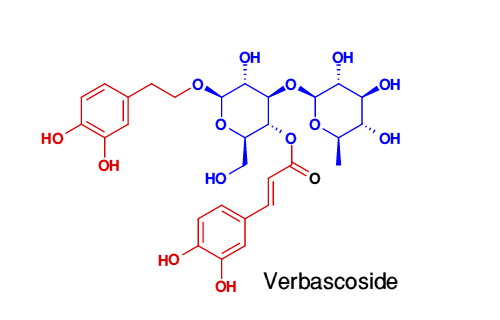 Varbascoside is a PhenylPropanoid Glycoside. 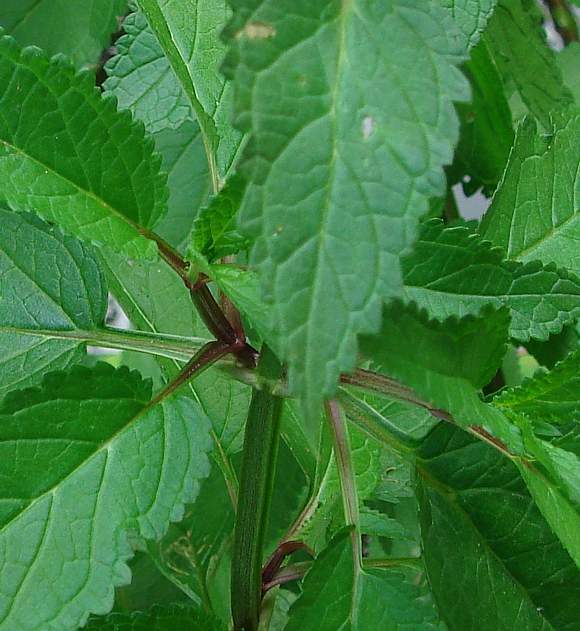 ScroPolioside is an Iridoid Glycoside exhibiting wound-healing powers, anti-inflammatory activity and is also hepatoprotective. 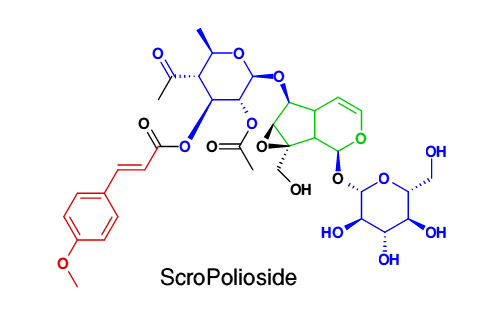 The only difference between ScroPolioside and ScroValentinoside is that the red-colured PhenylPropanoid moiety has swapped places with an Acetoxy moiety. 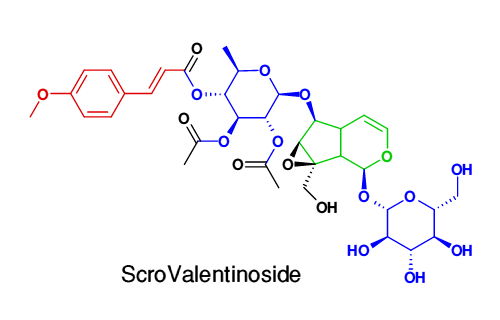 ScroValentinoside is a newly discovered Iridoid Glycoside. 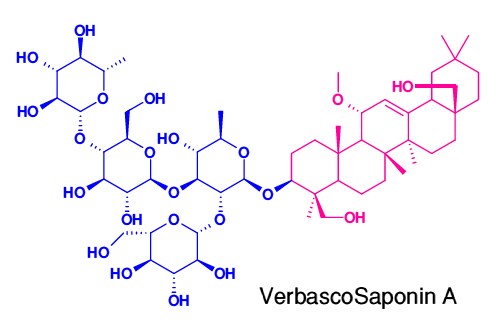 Verbascosaponin is an oleane -type Triterpenoid Saponin . Readers might spot the three differences between these two saponins: the addition of an -O- bond, the consequent moving of a double bond and the breaking of one upright of the bridge (shown in bold): all on the Saponin (purple part) of the molecule. 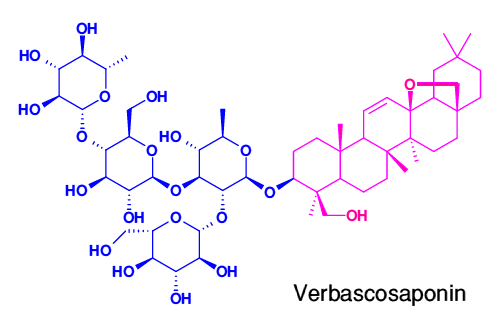 VerbascoSaponin A is another oleane-type triterpenoid saponin, this one is also found in Great Mullein.